The chart that we're reviewing this week for Makeover Monday is from Tech Chart of the Day. 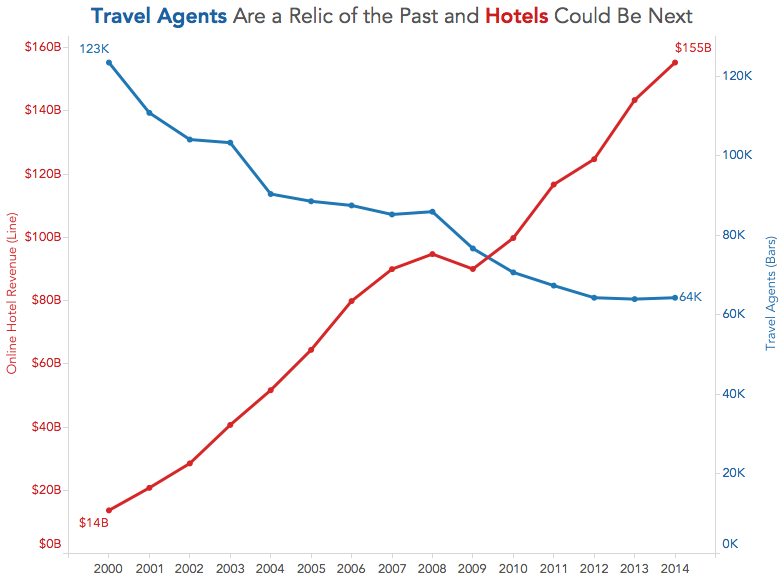 The title of the article "Travel Agents Are a Relic of the Past and Hotels Could Be Next" is quite catching, but the accompanying chart leaves a lot to be desired. The title is boring and doesn't capture my attention. I'm not exactly sure which axis goes with which colour because neither axis is labeled. The colours of the lines are too similar for me. For some reason, my eyes want to match the darker blue line with online hotel revenue and the lighter blue line with # of travel agents, but they're actually the opposite. A dual-axis chart is often used to show a correlation, but is the correlation explained by this chart. Ultimately, if I have to work this hard to understand such a simple chart, then it must not be done well. This week, I'm going to walk you through my step-by-step makeover, ending with my final version. Each step along the way addresses one or more of the problems mentioned above. Let's get started. First, I'll (1) change the title, (2) add the axis titles, (3) change the line colours to make them easier to distinguish, (4) colour each axis to match its line colour to aid in understanding, and (5) colour the keywords in the title to match the line colours. Ok, that's definitely better, yet for me it still doesn't address the issue with correlations and dual-axis charts. 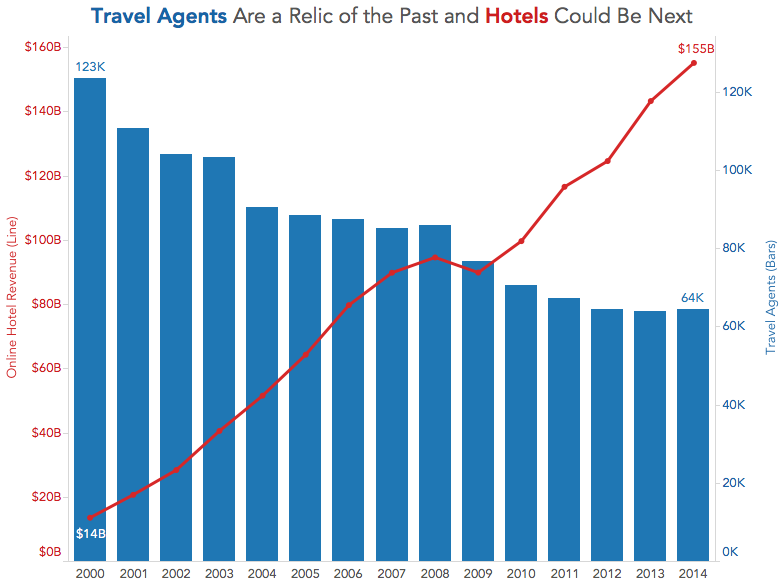 Let's make one minor change and convert the number of travel agents to a bar chart to make the view a combination chart. A combination chart like this makes our eyes separate the two metrics while still allowing us to see the patterns of both at the same time. 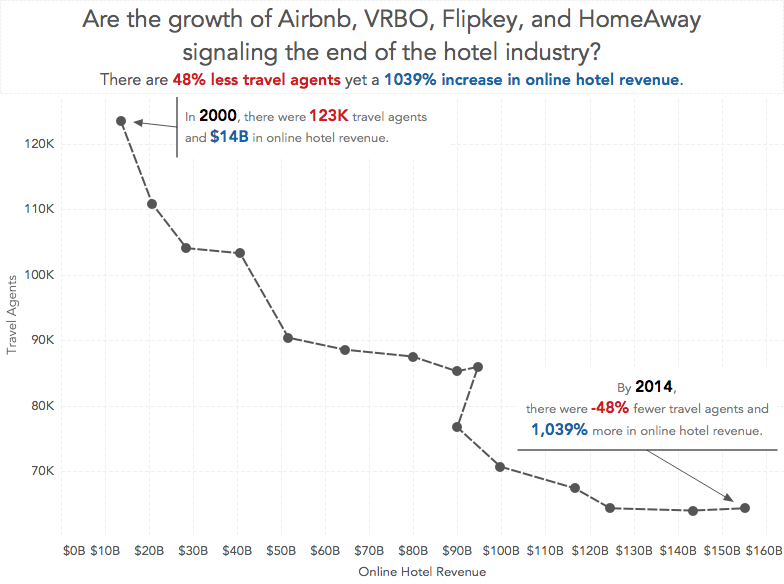 For example, it's easy to see that online hotel revenue is steadily increasing and the number of travel agents is decreasing. 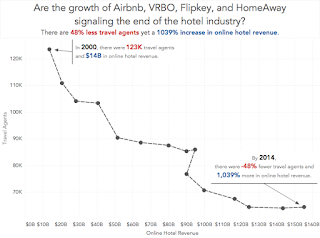 However, the story here is the growth of revenue for online hotel services like Airbnb, VRBO, Flipkey, and HomeAway compared to the decline of travel agents. So, with that in consideration, I wanted to see how the respective growth (or decline) rates since 2000. In this view, notice how I've significantly changed the title to meet the objectives of the story and how I've changed the axis titles. 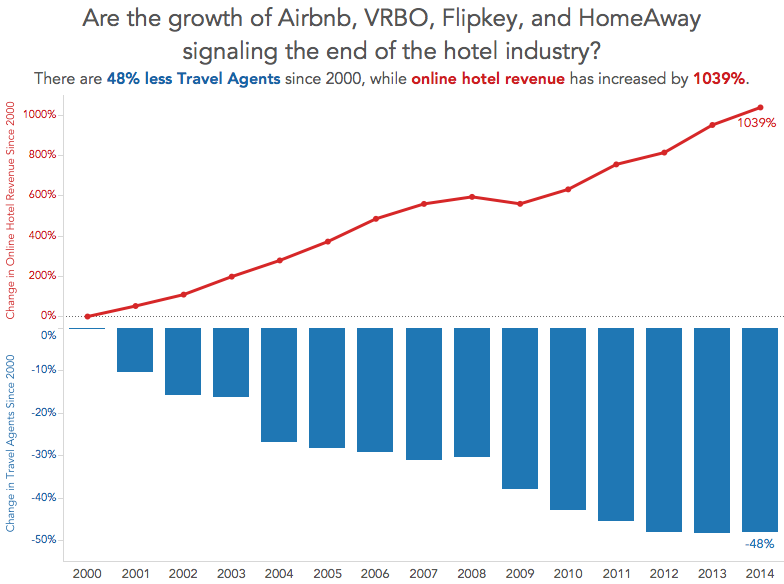 This view clearly shows the significant increase in online hotel revenue since 2000 and the fairly significant decrease in travel agents. Yet I still don't love it. The connected scatterplot imparts a sense of travelling a pathway through a terrain that has twists and turns, loops and sudden rises and falls that encode how the two different variables changed together. 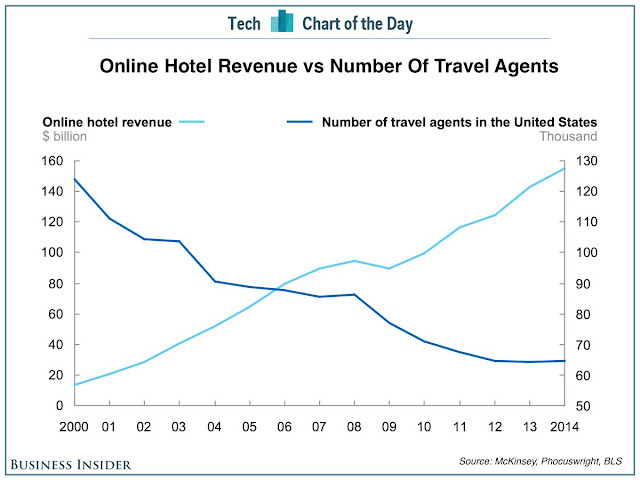 I really like how this shows how the decrease in travel agents and the increase in online hotel revenue shifts together. I also added annotations to drive the point home even farther. Yet I still feel like this isn't quite done. I like the annotations, but not the axis scales. While the % change gives me nice context, I feel like I'm losing the overall magnitude of the changes. Lastly, I removed the % change over time from each axis and went back to the raw values. I then made the line dashed because I feel like the dashed lines show the trails through time better. In particular, I like how the design of this connected scatterplot starts at the upper left and moves down and to the right. I used Cole Nussbaumer's "where are your eyes drawn" test by turning my head away then back and seeing where my eyes go first. They went directly to the upper left dot for the year 2000, just like I had hoped. You can download this workbook from my Tableau Public profile here. Nothing about what's actually being compared in this data set is clear to me. To back it up a step, I am not clear how comparing the number of travel agents to the revenue of hotels is meaningful in the first place. But if we assume that it is, what is that we're comparing? 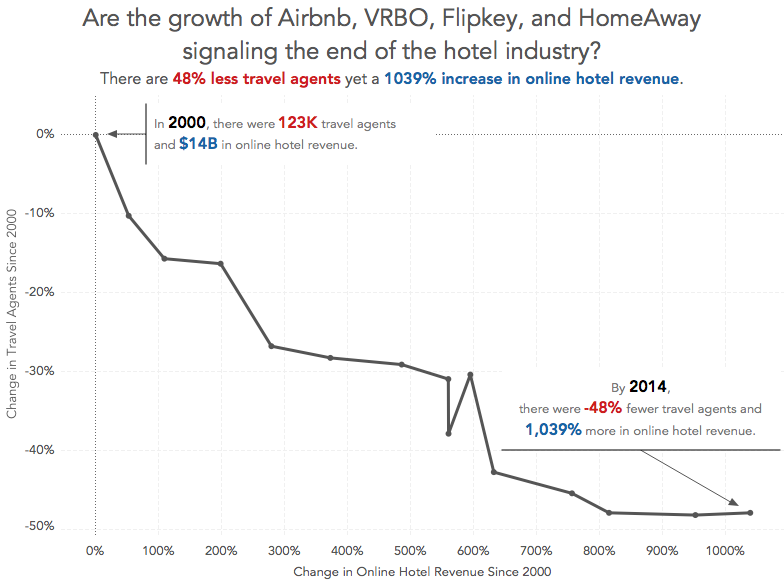 You've changed the title to indicate that we're looking at the revenues of alternatives to hotels, but the original, and the data, does not state that to be the case - it says "online hotel revenue". What does that mean exactly? And...it's increasing. So how does that support the title of the article? It would be much more meaningful to compare the change in revenue of hotels vs alternative lodging avenues. But whichever things we're comparing, I can't get behind a connected scatter plot to do it. It's not the worst way to show it, but I would much rather see two lines, plotted separately, sharing an x axis. My title comes from the article which states that the online hotel revenue comes from those sources. Please have a go at making it better. I see where some of those places are mentioned as examples in the article, but I didn't see anything that actually defines the scope of the revenue represented, or makes a clear distinction at all. Either way, this still seems like two sets of numbers that don't tell us much about the subject at hand in this way - I am not sure what the originators hoped to gain by plotting them together in the first place. Obviously it could stand some additional tweaking and annotating. But the point, for me, is that it's immediately and abundantly clear what's happening to both variables at any point in time, and no room for confusion between the two numbers, or confusion over crossing lines, or anything else. I don't want to sound overly critical, of course - I am enjoying this series, and seeing what you guys come up with. My biggest problem with this particular one is the value (or lack thereof) of the original analysis. I totally agree. The big dramatic title in the article was totally let down by the crappy graphic with little to no insight. Hence the reason it was a makeover Monday. Your next to last chart reverses the points for 2008 & 2009. Note the different ways the points are connected for the blip in the curve. I like the line/bar chart combo. It is similar to the line chart with two separate y-axis (above and below) but it's more dramatic and eye catching - as a data viz should be. The only thing I'd add is actual numbers and not just percentages as percentages could be often misleading.